The sky above Cuenca, Ecuador (Sara’s image). We celebrated these events with a day-trip to Ingapirca–a site popular on many Ecuador tours. 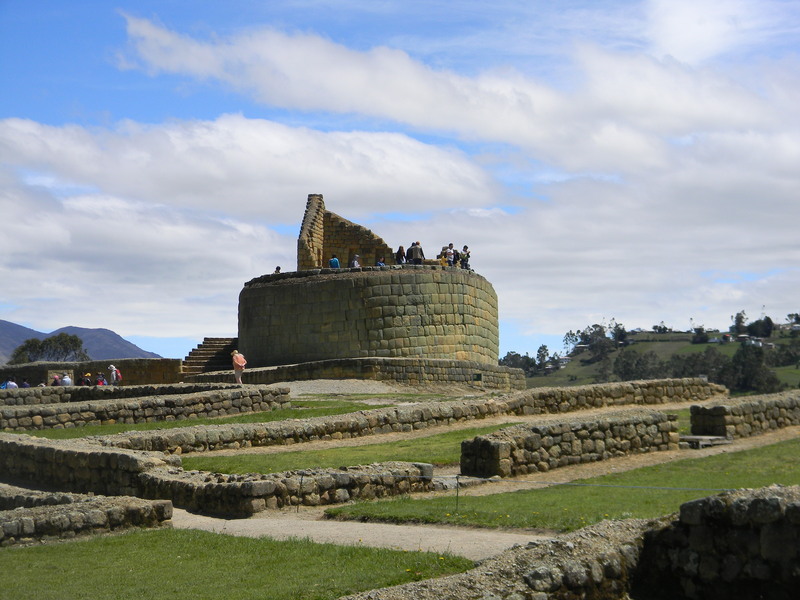 The most significant Inca ruin in Ecuador, Ingapirca is a Kitchwa word meaning “Inca wall.” A stop for some when hiking the Inca trail, this ruin is in the Cañar province and sits at an elevation of 10,200 feet (3,100 meters). Though not as impressive as Machu Pichu, Ingapirca is worth the two-hour trip from Cuenca, if you want to enjoy a ride through the Andean country side, alone–not to mention appreciate the stunning marriage of Inca and local Cañari architecture at the site. If you travel to Ecuador, visit Ingapirca. The last quarter of the drive from Cuenca is on a dirt road, but it’s worth it, if for the scenery alone. 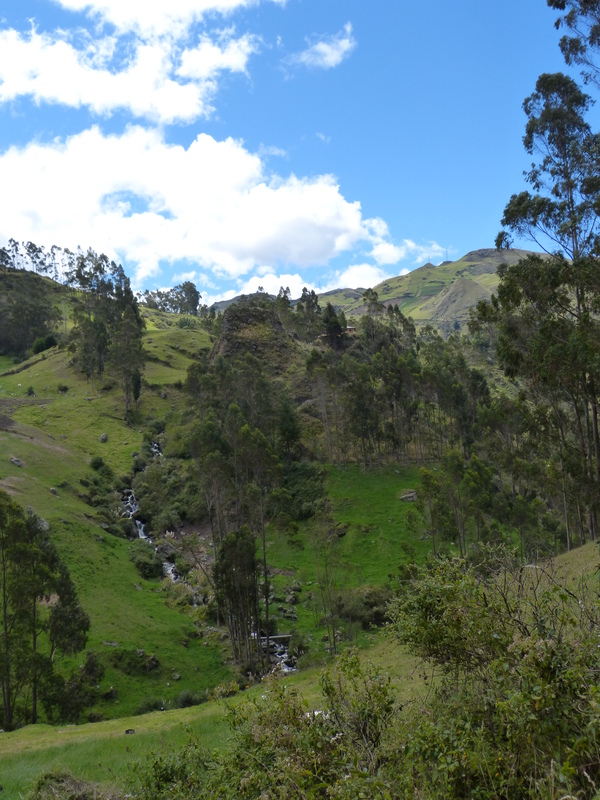 Stunning Andean countryside! 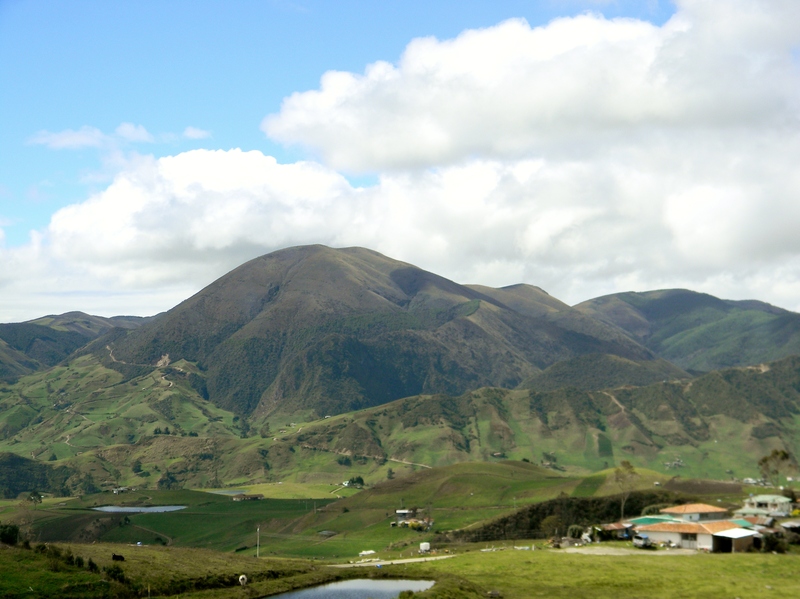 Andes near Ingapirca, Ecuador (Sara’s image). In the 15th century, as conquering Inca warriors moved north from the Peruvian Andes, they were unable to completely subdue the Cañari people, living in what is now southern Ecuador. 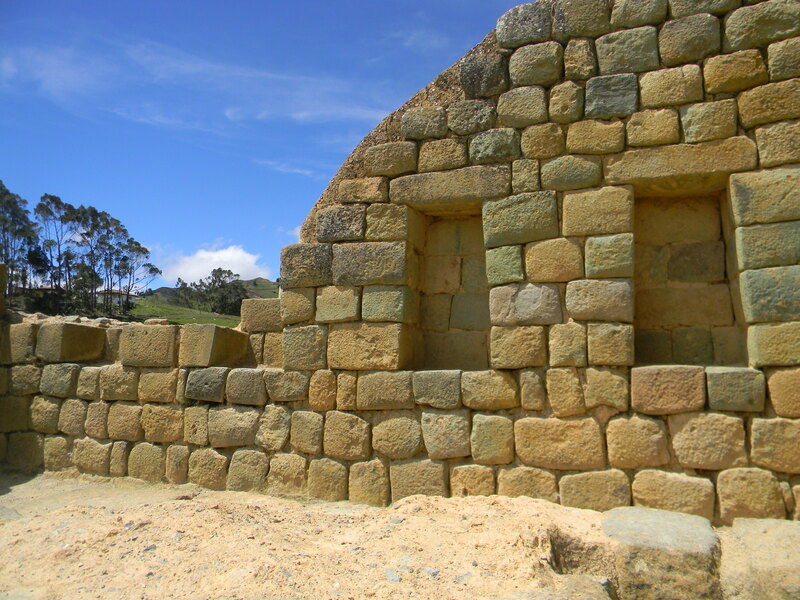 Instead the Inca ruler Túpac Yupanqui married a Cañari princess, and together their people built a temple at Ingapirca, on the site where the Cañari, as well, had worshipped. An initial view of Ingapirca. 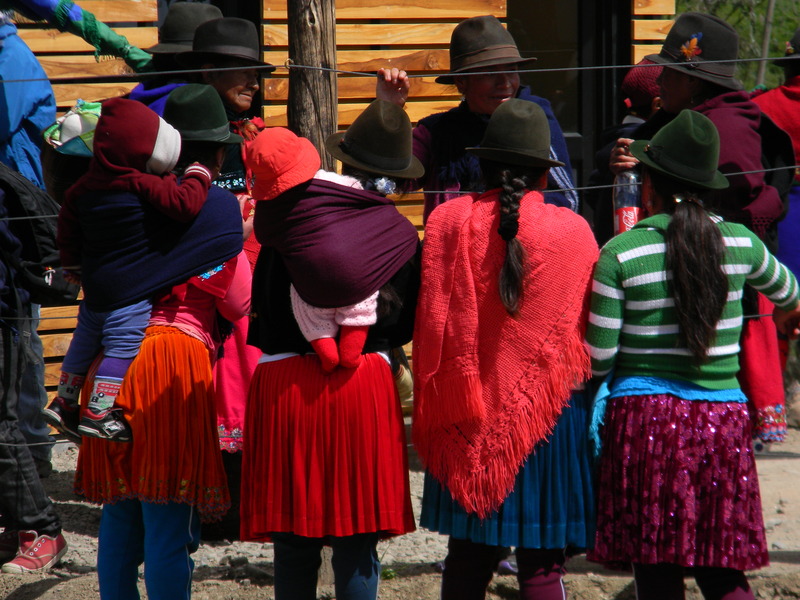 Once we’d arrived at the ruin, we enjoyed the colorful dress of contemporary Cañari families coming to Ingapirca to celebrate the solstice as their ancestors had. 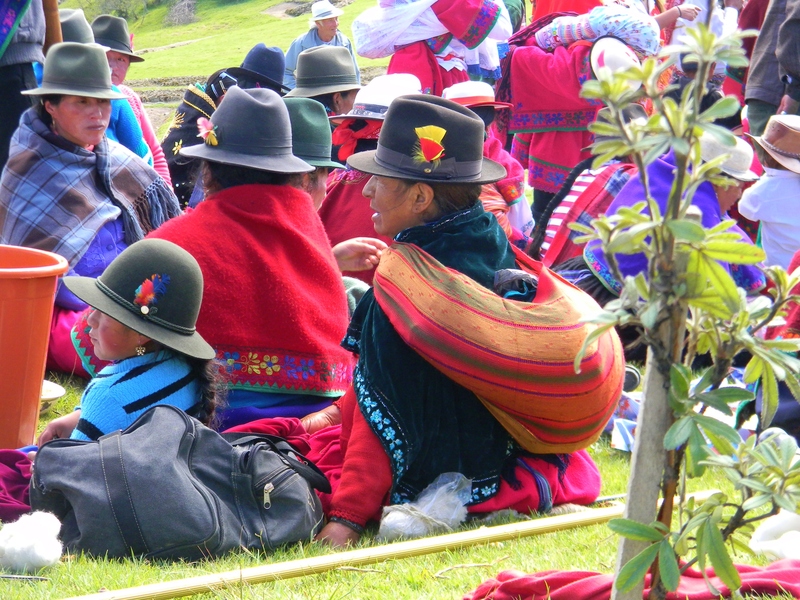 Local Cañari families arriving to celebrate the solstice at Ingapirca. Sometimes even children carry younger siblings on their backs. Cañari families picnicking at Ingapirca. 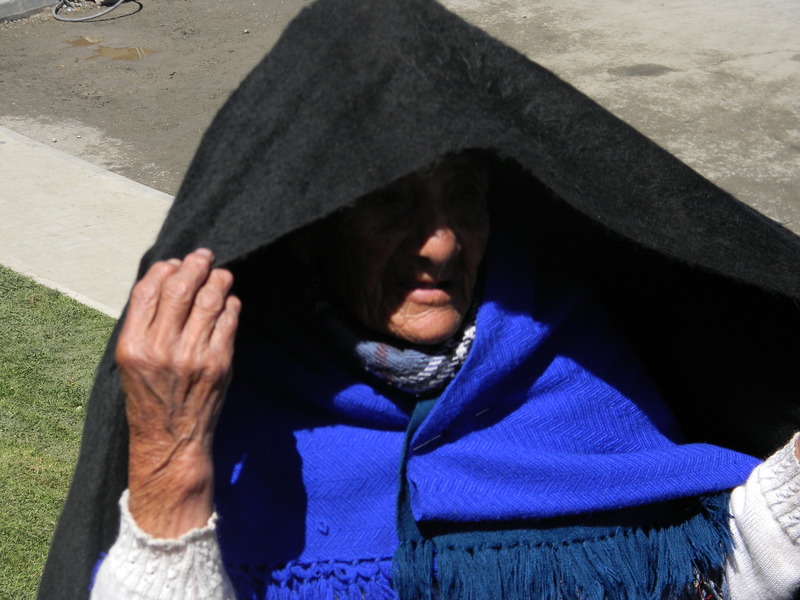 A local grandmother protecting herself from the intense sun. 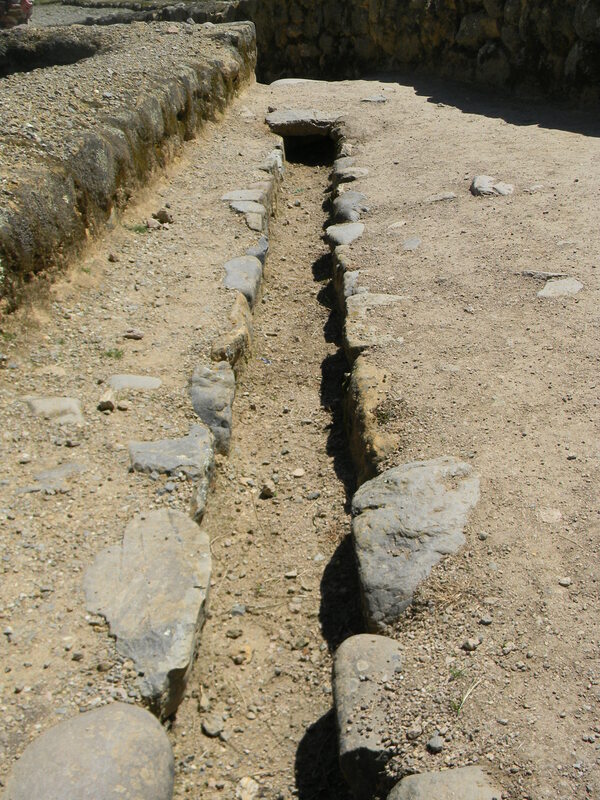 In the 1960s archeologists began excavating this site (one that the invading Spanish destroyed in the 16th century), uncovering, among other things, a complex system of underground aqueducts the Incas had built to provide water throughout the complex. 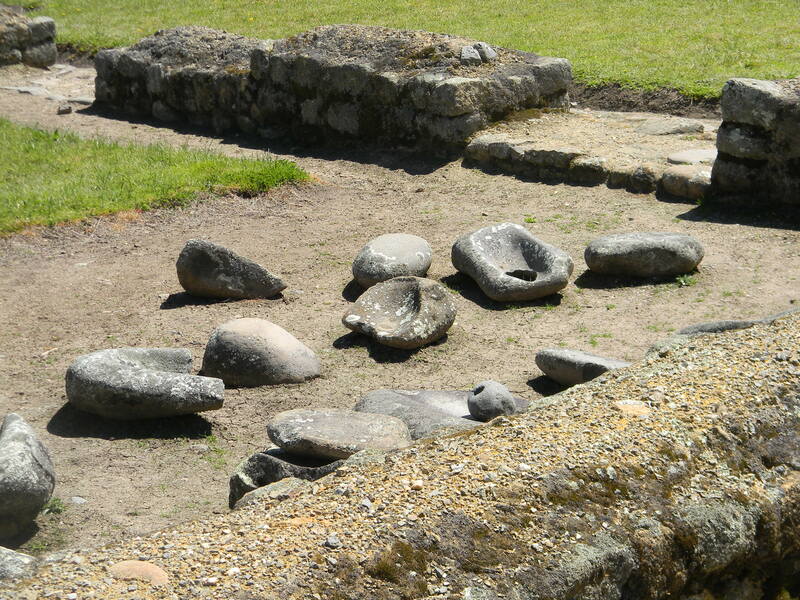 Archeologists also uncovered stones that the Cañari had used as calendars. 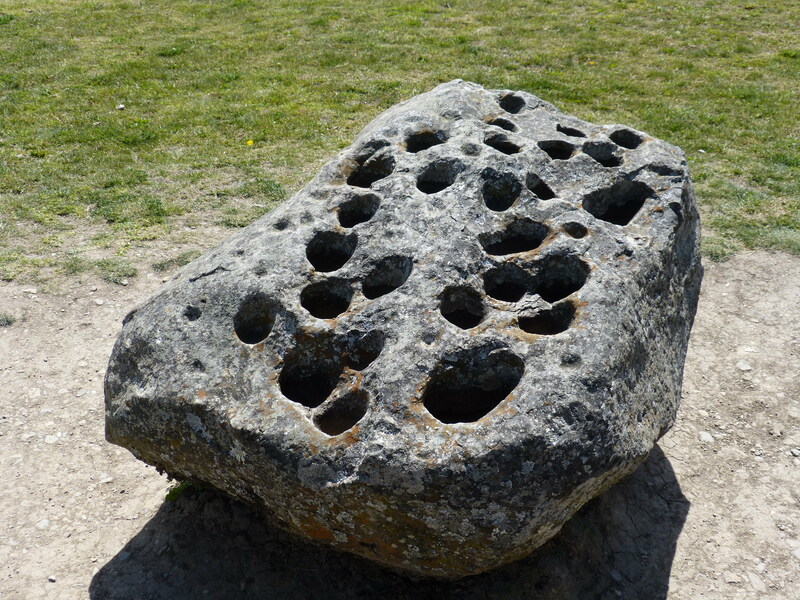 Experts believe, priests filled the stone’s 28 holes with water, and according to shifts in moonlight reflected in that liquid, identified the day in each of their 13 months. Cañari stone calendar at Ingapirca (Sara’s image). Close-up of the same stone calendar (Sara’s image). 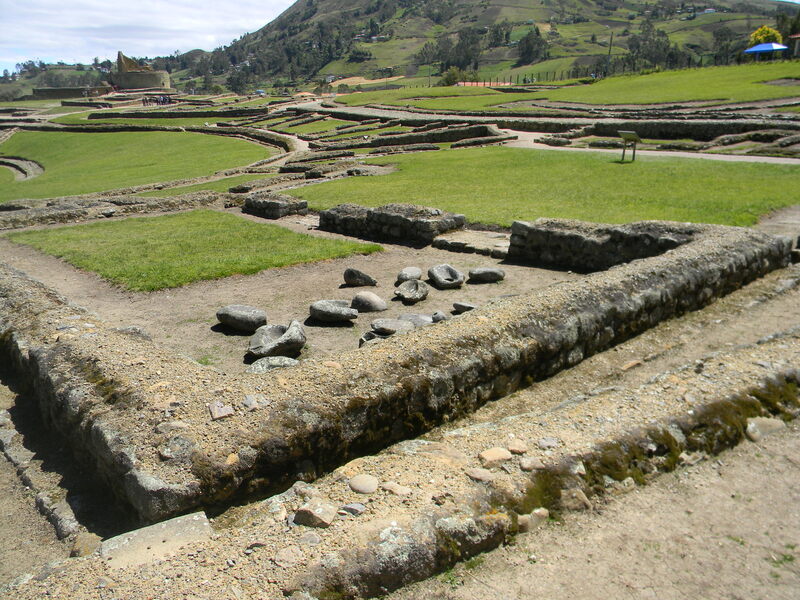 The site at Ingapirca was used primarily for worship by the Incas, who built a temple at the center of the complex, a structure that allowed light to fall in one of four nooks in the innermost wall, according to which solstice or equinox it was. 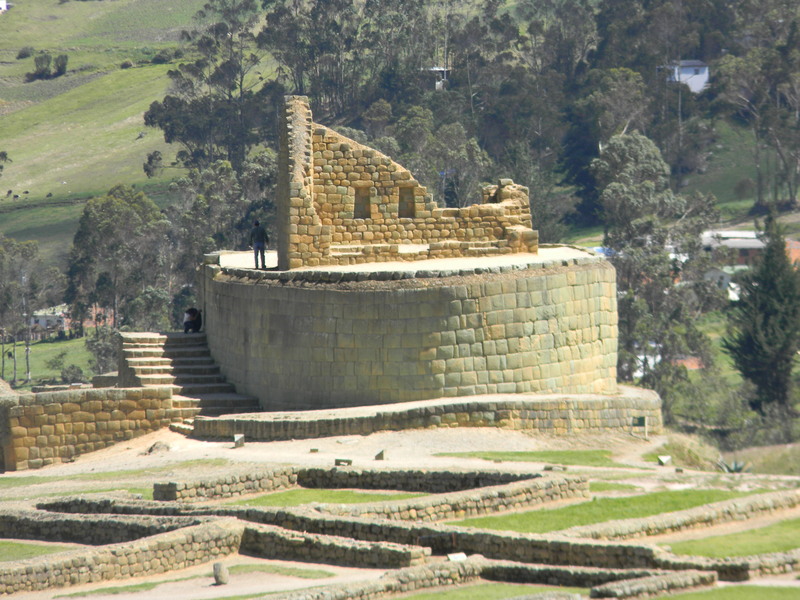 Inca temple at the center of Ingapirca. 4 niches on the innermost wall of the temple. During the summer solstice light falls in the center of the far right niche. 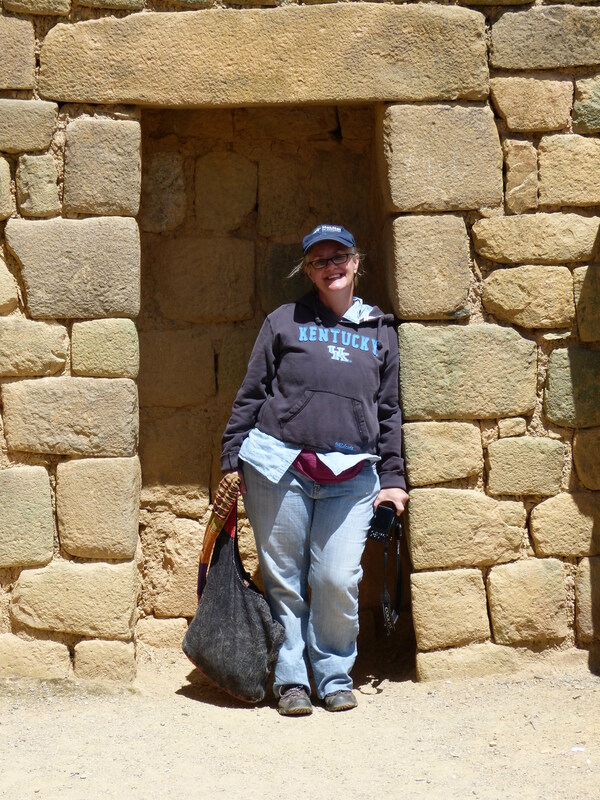 Notice the 2 niches on the far left are less well-preserved than the other 2..
Sara snapped a photo of me in the Inca temple. However, perhaps, most significant and enlightening to us, visiting on a weekend that marked both the solstice and supermoon, was the site’s marriage of Cañari and Inca building practices—the marriage of Cañari worship of the moon with Inca adoration of the sun. The temple complex, for example, mixes Inca and Cañari architecture, creating the only oval-shaped Inca structure in the world—oval according to Cañari custom, in honor of the moon—but with right-angled mortarless stones—the Inca way, in honor of the sun. 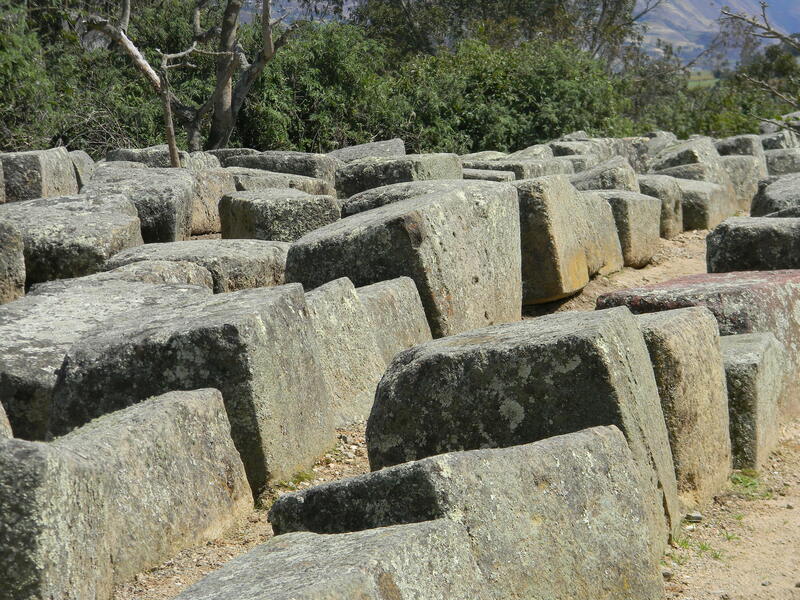 Right-angled stones cut the Inca way. The outer-most walls of the complex were constructed out of stones taken directly from area rivers. The rocks remained uncut and organic, joined with mortar, rough and irregular, but shaped into walls that, to this day, wind and twist and take right angles, all in turn. 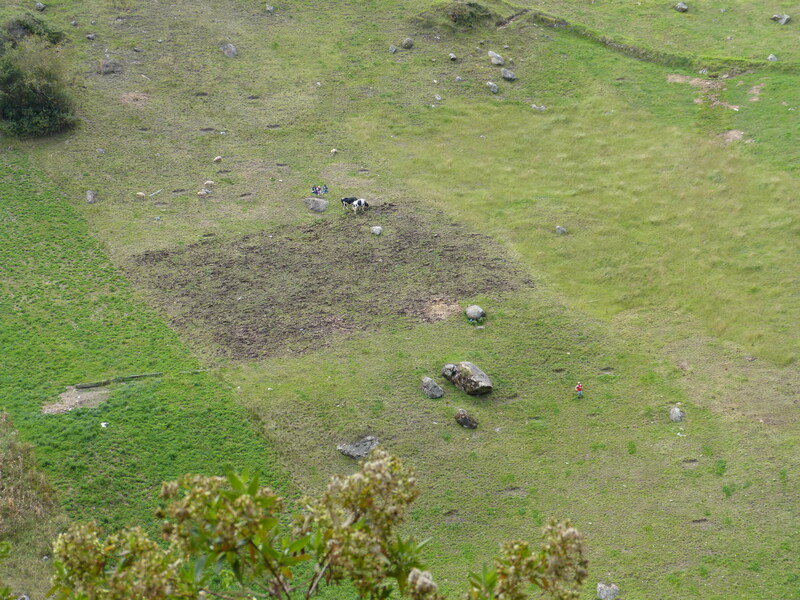 Example of both curved and right-angled construction at Ingapirca. We enjoyed seeing what our guide called “collcas,” circular structures where excess grain, especially corn, was stored. 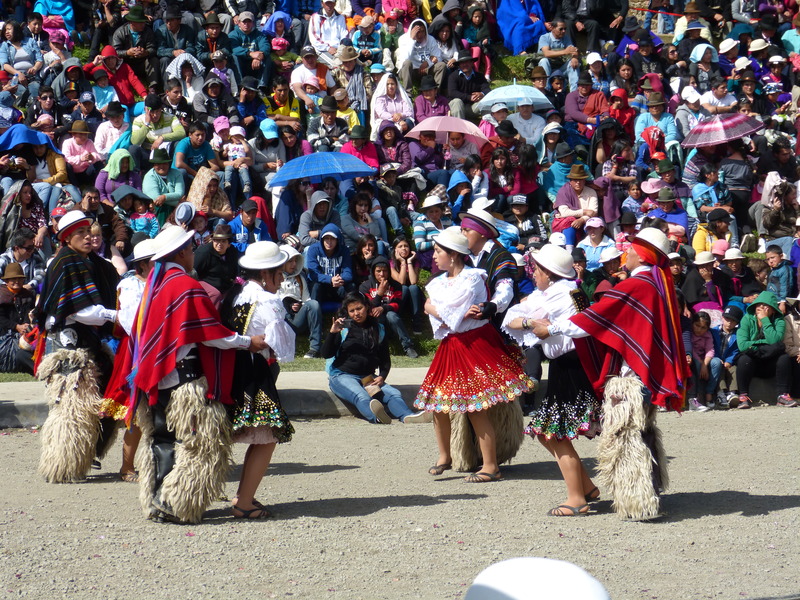 And since we visited on a solstice weekend, we were able to watch reinactments of Cañari and Inca ritual practices, especially those involving music, procession, and dance. A special solstice event at Ingapirca (Sara’s image). 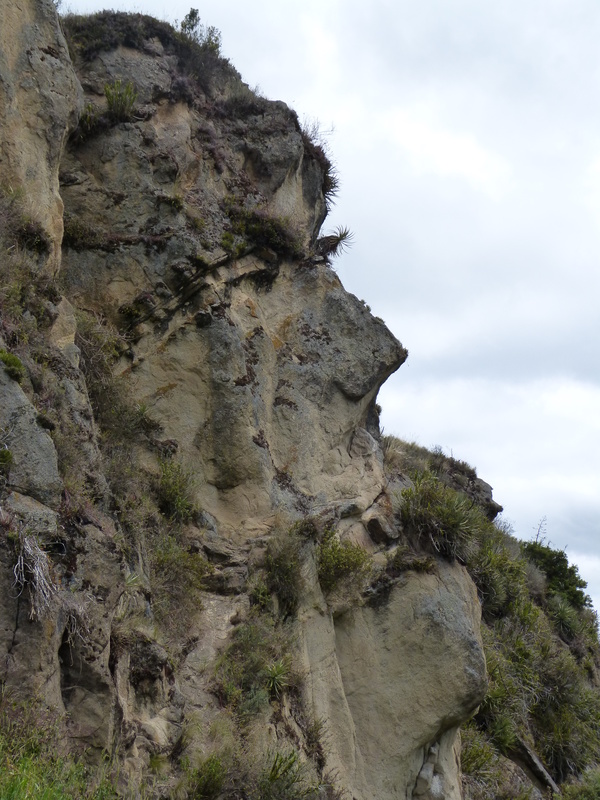 Finally, if your travel to Ecuador includes a visit Ingapirca, be sure to hike, as we did, to see the Inca face carved into a rock face in the nearby countryside. We watched children climbing the cliffs below. As we were leaving, we had one final look at the Andes near Ingapirca. (Sara’s image). So, as Sara and I make our way in Ecuador, establishing ourselves in this place that’s new only to us, I hope, we won’t forget our visit to Ingapirca, a site sacred to Cañari and Incas, alike. I hope, we’ll remember, as they did, to mix a bit of new with remains of the old—looking to the sky as they did, appreciating both the greater (solar) and lesser (lunar) lights that shine on our lives in this, their utterly lovely land. This entry was posted in Ecuador, travel and tagged Andean tours, Andes, Andrean mountains, archeology, Cañari, Ecuador, Ecuador tours, hiking the Inca trail, Inca Trail, Ingapirca, summer solstice, supermoon, travel. Bookmark the permalink. Love the pictures. Fantastic that you got to visit during the solstice and supermoon. Makes me want to visit even more. Have you and Sara bought hats like the locals wear? Take care. We hope you and Colleen will come visit soon. I know there’re some great mountain biking opportunities here. This tour was magical. Kathy, are you yearning for some of those colorful clothes? I am. Your drab blue jeans just dont quite hit the mark compared to these fantastic native clothing styles. BTW, what languages do the Indigenous people speak? Supermoon must have been Earth-shaking seen from your vantage point; here, it was amazing but from the equator it must have been sureal. Did you and Sara pack food or was there some kind of local vending? Also, what were the day and night temps? Is there any alcoholic beverage served at the site? Is there any drinking water available at the Ruin? The native people look very different from the Indigenous in Nicaragua; skin color and facial features are clearly unique. The moon is always amazing here–and was even stunning two nights before the supermoon. Yes, there was food sold at site the–a small restaurant, where we ate and many local venders selling things like pappas fritas and pop corn. And water was available. Interestingly, we are able to drink the local water here, as it is amazingly clean and delicious coming down out of the Andes. I’m dying to get some clothes. Considered purchasing a poncho there. I did get a necklace and table runner while we were at Ingapirca. There is an alcoholic beverage, but I forget what it’s called–the same basic one that the Incas drank. So when are you going to come visit? Sorry, JK. I almost forgot. Here in Cuenca the high averages around 70 and low around 50. Ingapirca is 2000 feet higher, so a bit cooler. Remember since we’re on the equator those temperatures are the same year round. 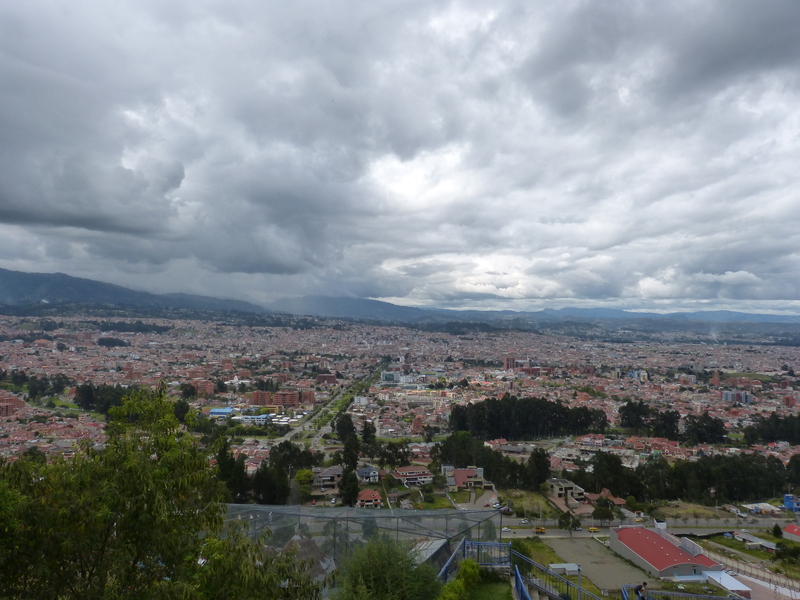 Cuenca is at 8,200 feet. Beautiful, beautiful writing and photos. Thanks for sharing, gals! Love you both. Oh, thank you, Mindy! I’m glad you enjoyed both the content and writing here. I always want to know when the writing works and doesn’t. It was SO wonderful to talk to you the other day! What a wonderful job you have done, offering a glimpse into the culture and history of this special place! Beautiful photos, too. You’re right….that sky is amazing! Thank you! Thank you, Cindy! It was an amazing place to visit–the spiritual site inspired the writing. Both Sara and I are amazed by the skies here. They seem alive–like they are almost inhabited with being and breathing. Great to hear from you, Cindy. Hope your week is going well. Gorgeous pictures with all the wonderful colors! Love reading about your adventures and your new country!! I’m so happy you enjoyed the photos, Beth Ann! Did you notice all of the reds? They truly are stunning. I wasn’t a huge fan of your favorite color until I moved here. Here red is almost magical. Thank you, my friend! Lovely post, Kathy. It’s a beautiful country, and you look happy. I’m so happy to hear from you this morning. I hope you decide to do a theatre trip that brings you to Cuenca—with the same group you went to Slovakia with. We’d love to have you! Such colorful people, captured beautifully in your photos. So weird that every time I’ve thought of the Inca people, I always think of the burial in The Color Purple, how they buried the missionary woman that had adopted Celie’s children in “the old Inca way”. I never thought about them having migrated or mixed cultures anywhere else in the world. And, I did learn something probably more simplistically new, and I’m almost ashamed to admit that in reading all of this I will also take away that Tupac (you know the rapper) is and Ecuadorian name. Most interesting though, is the blending of the cultures to worship both the moon and the sun, because, as a gardener I can appreciate the place that both have in our lives. Fascinating comment! I don’t even remember that line from the Color Purple, I’m sorry to say. The Inca’s primary civilization was in Peru–just south of us–at Machu Picchu–but I think they conquered Andean tribes all the way up into Columbia. And the name, Tupac! Hadn’t thought of that either! I can’t thank you enough for this comment. You have given me new things to think about! What a delightful post. I had no idea that this site existed and that the two cultures managed to work together, at least enough to construct it. I love learning new things and you’re beautiful photos enhance that experience. Thank you for sharing. Thank you, Lisa. I couldn’t help but think of you the day we were at Ingapirca and as I wrote this. You would have LOVED being there. I so hope you can visit the site yourself someday–and us! Thanks for sharing this with us, Kathy. I love seeing and learning about early people. I’m always enthralled by their use of the sun and moon to understand time, although I’ve got to tell you, I don’t ‘get’ the rock with the holes in it. . . Stories like this also make me wonder about the Cañari princess who married the Inca ruler. What must her life have been like? We’ll never know. I asked myself the same question, Christine, about the princess. I wonder, if she married willingly, or was forced to. I suspect it was the latter. That would be an interesting novel to write–reimagining her experience. One of us should write it! Somehow the moon light would reflect differently on the water in the holes, depending on what day it was during the month. I wish I understood more about it. So great to hear from you, Christine. I’m happy you are resolving your subscription issues. I may have to try that reader you mentioned. Take care, my friend! I’m so glad you enjoyed the trip, Charlie! I’m interested to learn more about the Incas and Canari. As you know, I simply love learning about new people and places. Hope your week is going well! Evocatively wonderful post and photos, Kathy! As soon as I saw the conglomeration of colorful clothing, I imagined you wearing all the parts, quite naturally and unaffectedly–shawl, skirt, leggings. You and color are necessary together! >:-D Reminds me of the art that pours out of you. So happy to see you posting again. Yaaaay! Thank you, Laurel. I imagine myself the same way, to be honest. I can’t wait to buy some pieces. I almost bought a poncho when we were at Ingapirca, but I couldn’t find the right one. You, too, would love the colors. Maybe you should come visit! I LOVE road trips–your other commenters point out our vicarious tripping. Thank you! Laurel, I know you would LOVE it! It would SO inspire your mosaic work. Seriously, think about coming once you are feeling well enough. You’d go nuts–in the very best of ways! We could play mosaic together! Kathy, oddly enough, even as my world contracted so catastrophically, in the coming out of it, I seem to be allowing possibilities in addition to those I had before illness. So, Ecuador is not out of the question. And who could possibly resist the invitation to go nuts?! hahahahahaha! Do I hear Art in your voice? Is it wanting to get out and play?! Maybe there is a painters’ group nearby and you could splash paint in mimic of those colors you see now? Yes, the artist in me is wanting to come out and play. I’ve been feeling it for a week or two. I don’t know of an artists group, but I have joined a writer’s group. I do know a blogger/artist who lives in Ecuador, near the cost. You might appreciate Lisa’s work. http://www.playamart.wordpress.com Glad to hear Ecuador might someday be an option. But–I’d still want to do Italy, if I were you. Gosh, I want to go there. Oh yes, still on for Italy somehow. In my head, I’ve expanded the trip to hit the British Isles and maybe France and the Nederlands, all because of the bloggers I’ve met. !! Thanks for the link to Zeebra. You’re right–I do like her art. Isn’t if fun how blogging opens the world to us in new ways? I totally love it. So glad you liked Zeebra Designs. I suspected you would. Stay cool over the 4th. I’m pretty sure that blogging is one of the big three that saved me over the last 17 months–that and reading (which was so hard) and art (didn’t know what I was doing, but I was making Art!). I’m so happy to hear from you, Claudia! I, too, love to travel vicariously. And I’m thrilled you enjoyed coming along for the ride. Can’t wait for our next road trip together! Take care, my friend! OH. MY. GOSH! Words escape me. They’re simply not needed with the breathtakingly vivid photographs you’ve provided in this virtual tour. THANK YOU. And thank you, again! Gosh, Laurie, I’m so thrilled you enjoyed my post. The best photos are compliments of Sara, but the unmarked ones are mine. You are so, so welcome. ANd thanks for tweeting the post! Thank you so much! Awesome post — so fascinating and so elucidating!!! I know this whole experience of moving to Ecuador is going to be so eye-opening for you both … and for us, your loyal readers!!! Thanks, Betty. I’m so happy to hear from you. You’re right Ecuador is simply amazing in so many ways. We will never be the same. And you all get to come along for the ride. Yippee! I’m tickled you enjoyed the post! Hope you are doing well! Cuenca has to be just this side of heaven for your artist mind! All that color! And that last sentence……brilliant, Sista! ……Incidentally, you should consider sending these sorts of pieces to travel mags. Your first person perspective and the newness of it to you will undoubtedly lend a flavor to them that folks will pay for. Oh, thank you so, so much, my dear! I was a bit afraid that last sentence might be a bit over the top, so I’m especially pleased it worked for you. You’re right. My artist self is so, so excited by this place–the color, especially. I would send stuff to travel magazines, if I thought I knew how to write a travel piece. I suppose I need to simply read some. And if they’d pay–how awesome would that be! Hugs to you dear Sista! Thanks, Sista. I had forgotten about that caveat. I need to read that anyway, however. Marvelous tour, Kathy. I really enjoyed learning about the site at Ingapirca. The way they were able to use carvings and orient the buildings to mark the calendar is fascinating, especially the Cañari stone calendar. Mostly I’m glad to hear that you’re enjoying your new country. How is Sara’s Spanish coming along? I, too was amazed by the science and architecture behind some of these things–the calendar, especially. To be honest, I don’t understand it all. Those folks must have had some fine minds. Sara’s Spanish is coming along nicely. Languages are not her thing. But she has improved by leaps and bounds. I’m proud of her. Hope your week is going well, Jackie. Barks to Reggie from my two furry friends. This is wonderful. Thanks so much for sharing your fabulous adventure. Stunning scenery, glorious colors — and I LOVE their hats. Yes, I agree, you should send this to a travel magazine. You have given us a truly unique and personal perspective, as if I were there. Thanks so much, Samantha! I happy to hear from you and to know you came from Lame Adventures–one of my favorite blogs! Interesting that you, too, think this would work for a travel magazine. I need to read a few and get a sense of style. Again, thanks for stopping by. I hope to see you again soon! OH MY GOSH! I AM SO JEALOUS!!!!!!!!!!!!!!!!!!!!!!!!!!! 🙂 But if I can’t lay my eyes on that stuff yet, I’m glad you can and can share it with us. I keep telling someone to look up TICKETS! That someone left a comment this morning that makes him sound interested in investigating tickets! I so hope you all can come soon. And until then, I’m happy to be your virtual tour guide. Hugs to both you and David! I’m so happy to hear from you! Can I put a visit with you on my Bucket list? LOVE the photos and your explanation with everything … just … enchanting!! Please, please put us on your Bucket List. We would be SO happy to have you visit us. Truly, anytime! SO happy you enjoyed the post, my friend! Hope your week is going well. I am so glad to get your comment on Sticks and stones as you are both on my mind daily. So I have entered my email again. Now I must catch up on my reading. This seems to have been a good move for both of you and I am a wee bit green with envy!! That was a fascinating post, Chris. I enjoyed it. And please don’t be envious, my friend. Come visit instead! That’s the perfect cure, right? We’d love to have you. And, gosh, we are loving it here. It’s everything we had hoped! Kathy, I loved this! I’ll be there next year for the solstice and can we go there? I know you’ll say yes, you always do! Of course, we can! You will love it, as will Sam! So that means it’s less than a year until you’ll be here. Yippee! This is exactly how I love to hike Kathy — virtually with Sara photographing the sites and you explaining what it is that I’m looking at. I do agree with the idea that you guys are terrific tour guides. I barely knew how to spell Inca and the Andes only brought to mind a horrific plane crash from way back when — until this post. So what is the story with the proliferation of Panama hats down there? I know it’s a cultural symbol worn by men, women and children. So people started wearing them when the Panama Canal was being built, but they’ve had such staying power. What is that about? There must be much more to these hats — other than that they’re made in Ecuador. How did I know you’d come up with a comment like this? You crack me up! If you “hike” the streets of Manhattan, you can handle this. You could even take your own photos. But thanks, dear LA, glad this works for you! About the hats–I guess Ecuador has been making them for centuries. They just got the misnomer after the building of the Panama Canal. Seems kind of unfair to my adopted home, if you ask me. What? Now Panama gets both the canal and the hats?! Damn Panamanians! Hope you’re staying cool enough in your garret! What a time y’all are having. I’m having a great time reading and looking at the pics! Much love.! Much love to you, too, dear Emily! Glad you enjoyed the post. How is your move coming along? Are you in Canada yet? Wow, great pics! It’s long been a dream to see Mayan ruins…these look pretty impressive, too. Kind of looks like a ship about to set sail. Keep exploring your new land – and keep writing and sharing pics, too. I love this stuff! I’m so glad you enjoyed the photos, Mark. I’d enjoy seeing Mayan ruins, as well. Ha! It looks exactly like a ship. I will keep exploring and writing about the adventure, for you. Hope you and Tara have a fabulous 4th! Thanks for stopping by! I was / am / continue to be mesmerized. Fabulous photos. Wonderful writing, of course I expect nothing less. I believe I am in love with the two of you, your adventurous life is simply what I yearn for. Oh, Val, we are nothing special. Ecuador is not Haiti (our last overseas home), in terms of risk or hardship. But, I’m so happy you enjoy what I write. That makes my day! Any chance you’ll come visit? We’d love to show you around. Hugs to you, my friend. We are sitting here talking about visiting Ecuador, Kathy. MTM brought it up. 🙂 I showed him your pictures, since of course, this post is right in his sweet spot. Oh, you totally should! It would be our delight to introduce you to Cuenca. I know Sara and MTM would enjoy one another with their architecture connection. And the colonial architecture is stunning in el Centro–which is, by the way, an UNESCO World Heritage Site–for that very reason–its architecture. We have two guest rooms, as well. Hint, hint! What a gorgeous place! You are going to have a great time I your new home. Thanks so much, Debra. We, indeed, love our new home. It’s a beautiful country! Welcome back to Australia, my friend. Beautiful, Kathy, and please tell Sara her photos are stunning. You’re sweet, Sandy. Thank you. I will be sure to tell Sara you enjoyed her photos. I’ll be sure to use the word “stunning.” I suspect she’ll be pleased with the feedback. Happy 4th, my friend! It has, indeed, been an amazing adventure so far. I’ll be sure to share with Sara your feedback about the photos. Though I must confess that the ones of local folks were mostly mine. I can’t seem to help myself. The good thing about Sara’s camera, however, is this. When she takes close-ups of people they rarely know, since she has a pretty powerful zoom. Mine isn’t quite so good. About the visits, we’d love folks to come–INCLUDING YOU! We don’t have an hotel, but we do have two guest rooms. Just let us know when you’re coming! Happy 4th, my friend! I loved the content of your post and the beautiful photos you are sharing on your blog site with your followers. 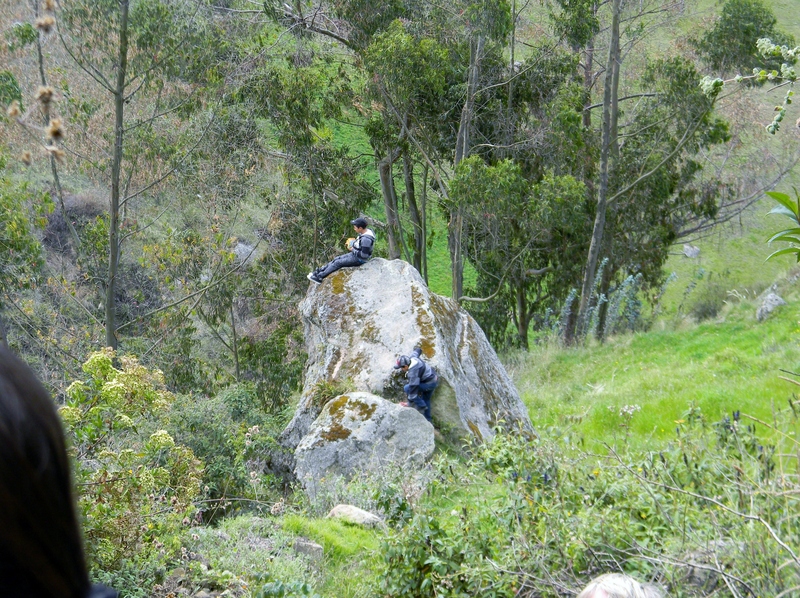 I can’t get over how lovely the scenery is there in Ecuador. Do you travel a lot? You take excellent photos by the way. I hope to keep following your blog and your travels to other countries if you are going on another journey soon. Hope your 4th of July was very safe and you enjoyed the time with your family. I had a great 4th and I wish you happy traveling. I’m afraid I didn’t take all of the photos in this post. My partner Sara took a number of them. I’ll tell her you enjoyed them. I suppose we do travel a good deal. 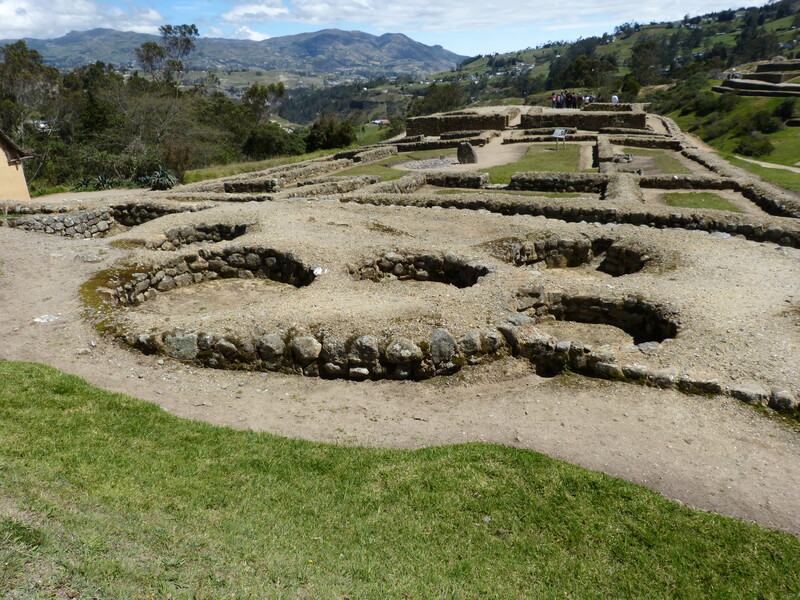 However, we now live in Ecuador, so this visit to Ingapirca was merely a day trip from our home in Cuenca. Thanks so much for stopping by. Hope to see you again soon! Great post and I loved your photos. 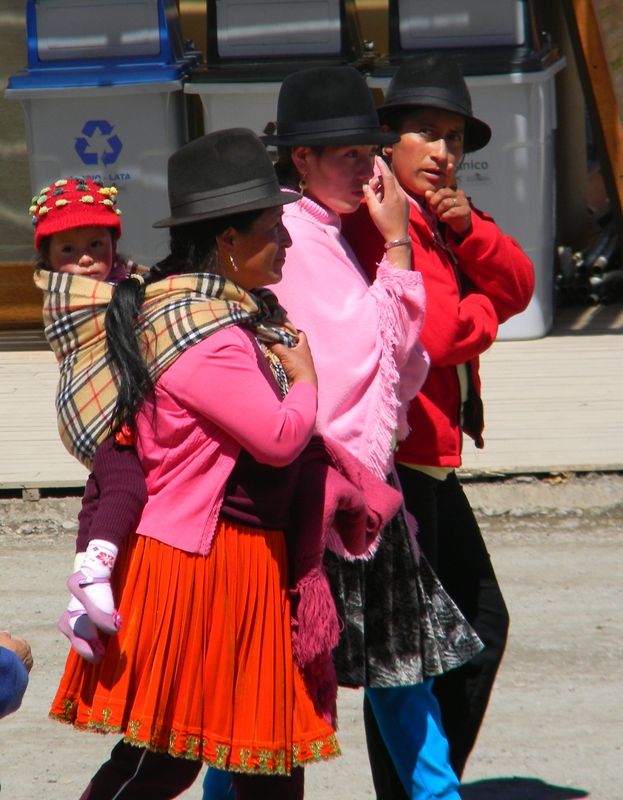 I love the colorful clothing of the local people, and that Inca face on the mountainside is very cool! Looking forward to more of your travel adventures! Thanks so much, Terri. Great to hear from you. I, too, love the colorful clothing. About the face–we were told that archeologists differ as to whether it’s natural or man made. Hope you’ll stop by again soon! Looks like such a lovely place Kathy! Have you adjusted and feel like its home yet? Thanks, Nicole. It is, indeed a gorgeous country. And it DOES feel like home–very much so. In fact, we felt at home almost immediately. Hope you had a wonderful vacation at the lake! Thank you for taking your readers w/ you, dear. Hello, my friend. I’m so glad you enjoyed the virtual journey. I think the hats are a hoot, as well. Hope you’ll come visit us here in Ecuador, once you get that needed vacation! Take care. Hope your week is going well! Julia, I’m so sorry it’s taken me so long to respond to your comment. It’s been crazy down here–good crazy–but crazy. I’d delighted to hear from you. I will tell Sara you enjoyed her images. However, the ones with the colorful clothing are mine. So thanks! Take care, my friend, and hugs to you! Dear Robin, please forgive how long it’s take for me to respond to your kind comment. It’s take time and energy to settle in–more than anticipated, for sure. Hope you are enjoying your new home! Great to hear from you! If only all challenges could be settled by a marriage. The Solstice hints that it might just be possible. Thank you for taking us along on this adventure. Would love to visit this place someday. Kathy, I’m sorry it has taken me to long to get to these comments! Hope you’ll forgive my tardiness. It’s been busy down here. However, we would love you all to come visit us down here if you ever get the chance. I suspect you would both LOVE it! I’m delighted to hear from you, and again please forgive me! thank you for all these lovely pictures. So much life, past and present. 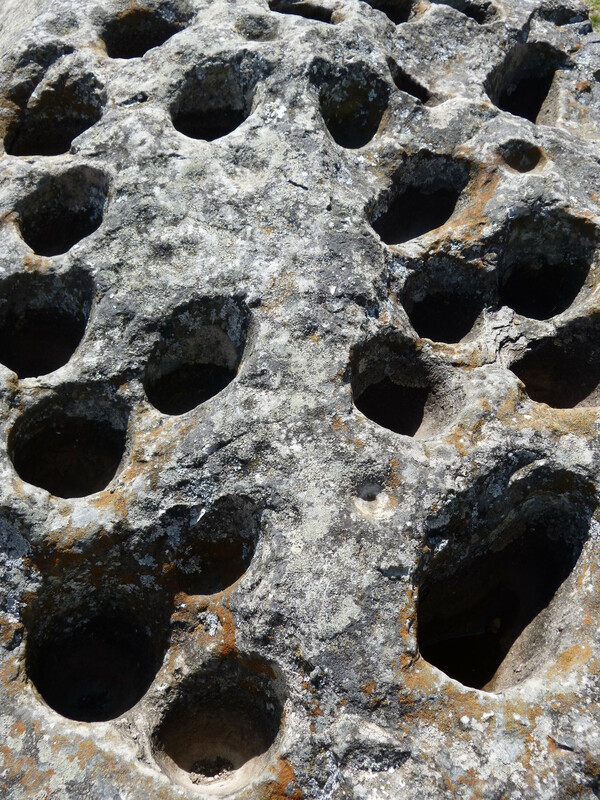 I found myself wondering at the hours it would have taken to carve the holes in the calendar stones. We leave for France on Sept 9th and will begin our year of wandering Europe! And then? Joss, I pray you’ll forgive my tardiness in responding to your comment. This has been an exciting but time-consuming process–as you might know! And, yes, imagine how long it must have taken to carve those holes. I thought the same thing. I totally can’t wait to follow your adventure! Then? Well, maybe Ecuador? So glad I made it over to your blog today – loved this post. Great images – both yours and Sara’s. Fascinating to see that though Ecuador’s on the Equator you’re so high up over there that the countryside isn’t lush and tropical. I imagine that’s why their clothes are so colorful? Why did they have to destroy it? I’d love to see how the calendar stone works. Oh, Rosie, I’m thrilled to hear from you! I, too, wish I actually understood how the calendar stones worked. But, gosh, such genius! And I know what you mean about the “invading Spanish.” So sad. So tragic. So criminal, actually. I’ll tell Sara you enjoyed her images. It was a wonderful day and exciting visit. But I’m so excited to hear from you! Hope your summer is going well! Hugs from me! I’m feeling well enough now to catch up on my blog reading. Thais was such an terrific post. I loved the images and found the information about the calendar stones to be fascinating. So much history, knowledge and wisdom has been lost to conquering hordes the world over. It’s sad because of all the species we are the top when it comes to the ability to cooperate for the benefit of rather than competing to the detriment of most. I’m so happy to hear you’re feeling better! I think it’s even more miserable to be sick in the summer, for some reason. Glad you enjoyed this post. I, too, was so fascinated by the calendars stones. It’s sad what colonialism did to all but wipe out that culture. You are so right! Thanks for stopping by, and again, I’m thrilled you’re feeling better! EDIT: It’s sad because of all the species we are the top when it comes to the ability to cooperate for the benefit of all, rather than competing to the detriment of most. Yes, exactly! I understand totally. Cool! The solstice/supermoon weekend was my birthday weekend as well. 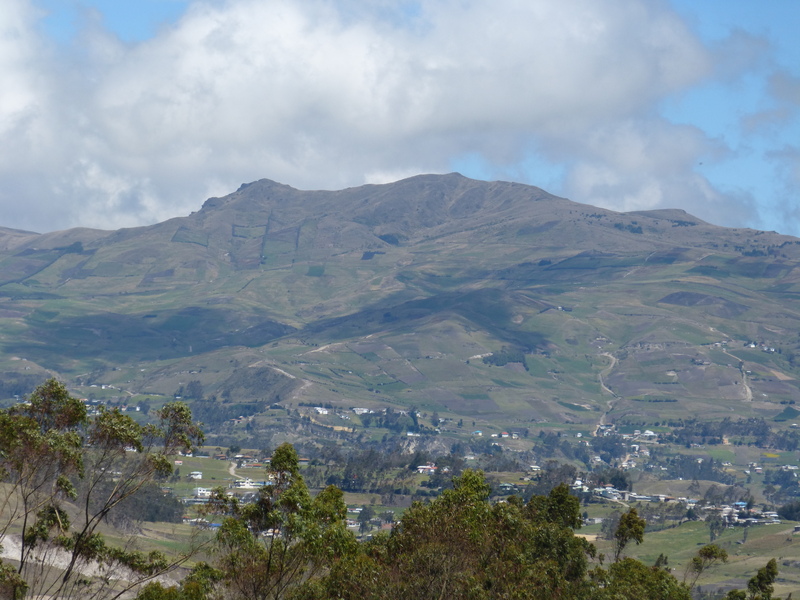 I thought I had a decent weekend at the harbour, but after reading this post, I would have MUCH rather been hiking in the Andes to see the Inca face. 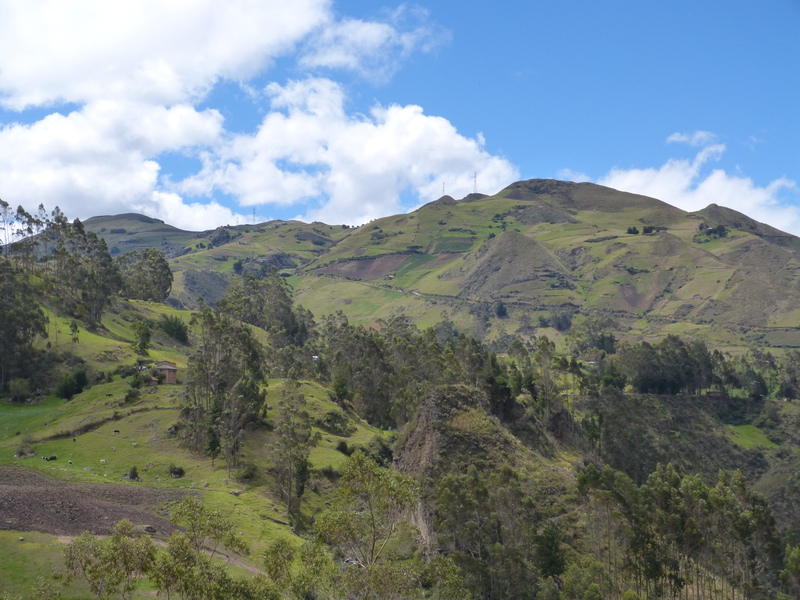 Love the photos, Kathy– I definitely see a trip to Ecuador in our future.